Canadians are slowly warming up to the idea of taking furnace rental service for their comfort needs. In an average household, the furnace unit could be anywhere between 10 to 25 years old! Mostly rigged by flawed installation and persistent maintenance, running an old furnace in Toronto is 30 percent costlier than getting a new furnace from sale or on rent. 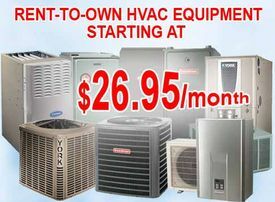 HVAC contractors in Toronto offer zero replacement cost, with free ductwork installation for every new furnace sale made. However, you still need to do a field check on the kind of furnace you are renting as missing out on vital operations can cost you dollar and time in the future. However, the sale season for furnace Mississauga is highly unpredictable and mostly precedes the winter season. The cost of furnace rentals fluctuate by 10 to 40 percent during the peak season, Best HVAC contractors maintain a standard pricing model all-round the year to benefit the clients looking to replace their old models. Temporary residents and those who can’t afford the price of a new HVAC unit in Toronto have a highly customised package on offer. Furnace rentals are available on flexible payment mode where the buyers can explore multiple options- weekly, monthly and half-yearly rental solutions. In Toronto, renting a furnace unit is hassle-free and simple with minimum paperwork. If you are a tenant, you an avail the rental facility with free transfer policy by getting your landlord’s approval. If you are unsatisfied with the services of the HVAC contractors in Toronto offering furnace rental units, you can get free replacement on the available units with proper assessment of your problems all over again within 24 hours.